My office and I exist at different ends of the entertainment spectrum. I go to museums for fun, they only go if dragged by an out of town elderly aunt. I go out to dinner in Cambridge (fusion cuisine, small, innovative + cocktails), they go out to dinner in Boston (classic high end and/or neighborhood dive bars). I plan excursions to Newport to tour Gilded Age mansions and have high tea, they go to football games and tailgate. Overlap only ever tends to occur at the nexus points of Harry Potter movies and HBO shows. When people in my office asked me what I’d done this weekend the response to “I went to the annual Corn and Tomato Festival at Verrill Farm” was met with a long pause and an expression of ‘well, of course you did’. I, however, refuse to apologize for an afternoon spent sitting in the sunshine watching small adorable children being given rides on equally small adorable ponies while sampling 20 kinds of tomatoes, 10 kinds of corn and a tent’s worth of dishes made from seasonal farm produce (the chilled corn-poblano soup was particularly spectacular this year) and listening to a live blue grass band. Every summer I do one Dinner that’s sourced almost entirely from local produce – this year I think limes and pomegranate were the only outliers. With August is wending to an end, Labor Day Weekend rapidly approaching, the weather just starting to hint at the end of summer, and the farmers markets starting to carry Fall produce this seemed like the week to do that Dinner. As I put away the groceries on Sunday afternoon I was somewhat surprised to discover that my fridge was not as jam packed as I had expected it to be. However, by the time I’d finished cooking on Monday this was no longer the case – prepared food somehow takes up much more space than raw ingredients. I played a challenging game of fridge Tetris. Fortunately I’m much better at fridge Tetris than I am at the regular computer version. If this seems like more food than anyone sane could consume, this is true and yet I was helpless in the face of all the tasty bounty of Summer. Things just kept building on each other. 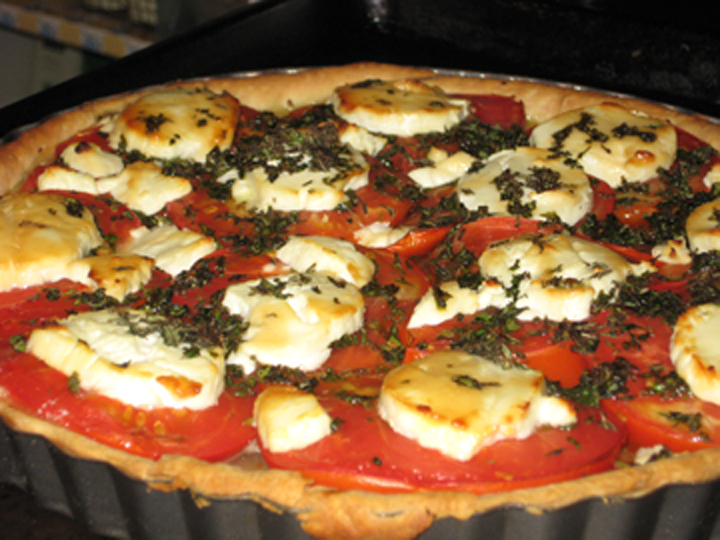 The Tomato Tart was the centerpiece of the Dinner. Salad was a given. I wanted eggs as a vague gesture in the direction of a protein. I needed bread to mop up the garlicky buttermilk sauce that doused the eggplant, and since I had bread I might as well finally stop at the Lawson Farm Cheese Stand and buy some of their seasoned fromage blanc. This was a meal in which every time I removed a dish from the table I added another one – I removed the soup bowl and added the tomato tart; I removed the empty tart pan and finally had room for the salad bowl . . . . Fortunately, Dinner, once again, proved more than willing to perform a magic act and vanished food from the table with alacrity. 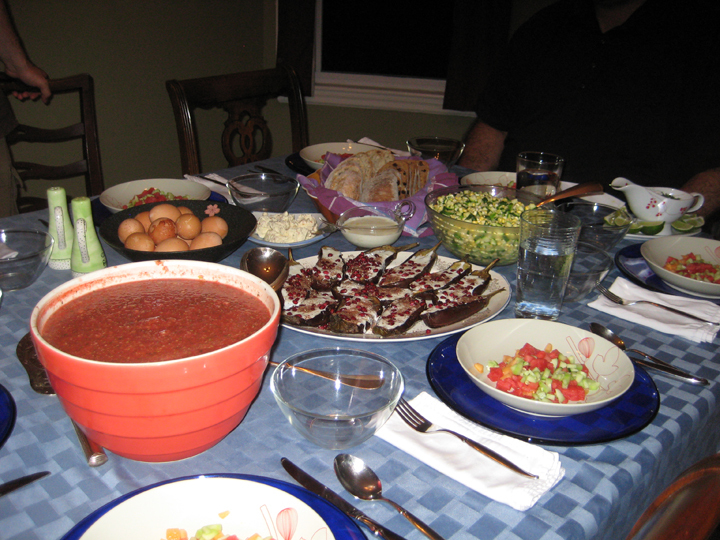 The amount of leftovers packed away at the end of the evening was startlingly small. And now, please indulge me in a moment of sheer and unadulterated pretension and allow me to source all of the evening’s ingredients. 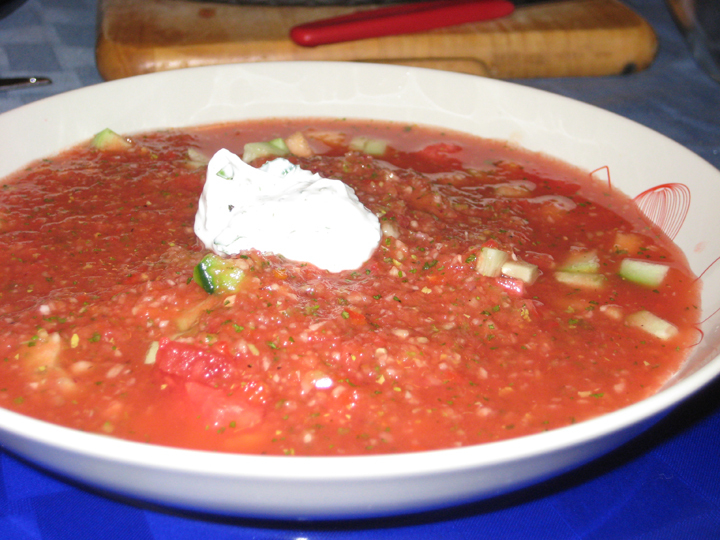 When we were in New Orleans we had the most amazing watermelon gazpacho at John Besh’s restaurant August. This is not that gazpacho. It is neither as delicate, nor as subtle. It also does not get poured out of a silver coffee carafe over a selection of the world’s tiniest melon balls by an attentive waiter. In its robustness, however, it is a little more suitable as a significant portion of a dinner menu, and still very very pretty (and pink). If you wanted something that was more luncheon appetizer delicate you could strain the pureed soup and cut your melon/cucumber garnish as small as you had the patience to achieve. It’d be gorgeous served in shot glasses, or poured from a tea pot into porcelain tea cups, with melon balls in the sugar pot and some thinned yogurt as garnish in the milk jug (and, now I really want to do this). Working in batches, puree all ingredients in a food processor (this is exactly as messy as you think it will be). Pour into a large serving bowl. Taste and season accordingly (I needed more salt and vinegar). 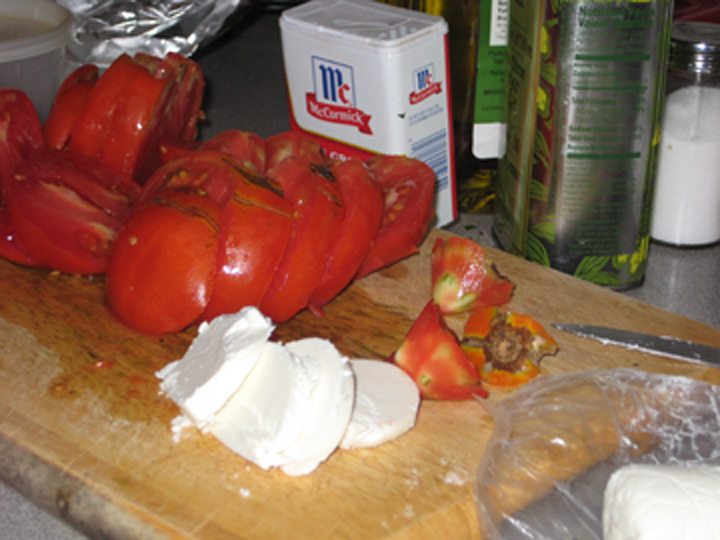 Refrigerate 4 hours, or overnight, until cold. 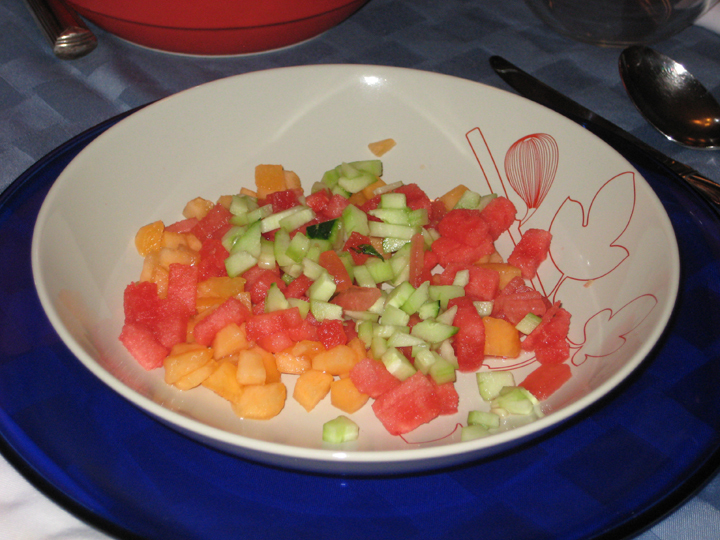 Arrange about 1/8-1/4 cup each of chopped melon/cucumber in the bottom of each bowl. Pause for dramatic effect. Ladle soup over melon/cucumber. Serve with lime wedges and mint yogurt on the side. I daydream about this tart all summer. I don’t make it as often as I think about it largely because I know what goes into it, and I find it hard to justify that much butter and cheese on a regular basis. This is a Yotam Ottolenghi recipe. If you don’t live in London or surf food blogs it’s possible you’ve never heard of him. He’s primarily known for his Middle Eastern twists on vegetable dishes, and is one of the feted darlings of the nouveau vegetarian cuisine circuit. He isn’t actually a vegetarian, nor are his restaurants, but I don’t think I’ve ever actually seen an Ottolenghi recipe that wasn’t vegetarian. And honestly, while I sound a little snotty about him, the chance to eat at one of his restaurants is one of the (many) reasons I want to take a vacation in London. If all his vegetable recipes are as good as this one, it’d almost be enough to make me rethink my stance on the importance of bacon. Cut the eggplants in half lengthwise – cutting through the stalk (the original recipe specifies that the stalk is purely aesthetic and that you shouldn’t eat it – I wonder, this is a necessary admonishment?). Deeply score the cut side of the eggplant in a diagonal pattern, just be careful not to cut all the way though. Place the eggplant halves, cut side up, on a parchment lined baking sheet. Brush with all of the olive oil, sprinkle with thyme leaves and lemon zest, and season generously with salt and pepper. Roast for 20-35 minutes until flesh is very soft and browned. Remove from oven and allow to cool to room temperature. Note: I actually found that I thought the roasted eggplant benefited from not just being cooled to room temperature, but to being refrigerated overnight. After the eggplant is cool enough to handle I turned them cut side down on some paper towels to drain off any excess olive oil that hadn’t been absorbed in the roasting process. I then placed them skin side down on more paper towels, loosely covered them with plastic wrap and refrigerated overnight. I pulled them out of the fridge the day I was going to serve them and allowed them to sit at room temperature for about an hour to knock some of the chill off of them. Whisk together the buttermilk, yogurt and olive oil. Mince the garlic, sprinkle with salt and then use the flat of the knife to smear it into a paste. Whisk into buttermilk-yogurt mixture. Refrigerate until needed. 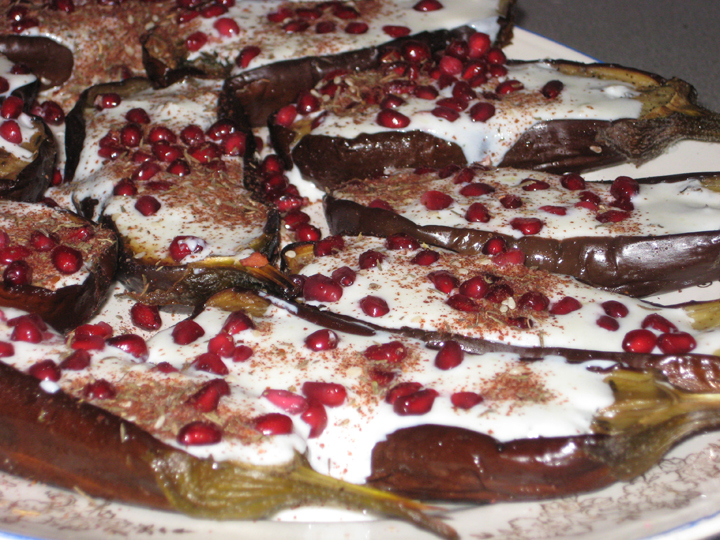 To serve spoon the buttermilk sauce over the eggplant, scatter the pomegranate seeds generously over the eggplant, and sprinkle with the za’atar. Finish with an additional drizzle of olive oil if you wish (I didn’t think this was necessary). Note: Ottolenghi recommends the ‘hold the pomegranate cut side down over the serving dish and bang with a wooden spoon’ method of seeding pomegranates. I think the only reason to do this is if someone else is cleaning your kitchen and you kind of hate them. I suggest scoring the pomegranate in quarters and then seeding it (under water) in a large bowl of water – the seeds sink, the pith floats, and if you break some of the seeds the bright pink juice harmlessly colors the water instead of your counters, walls, and clothes. This is one of my favorite summer salads. It’s fresh, sweet, crunchy and comes together in next to no time. Glad you able to pick up so many ingredients at our farm.